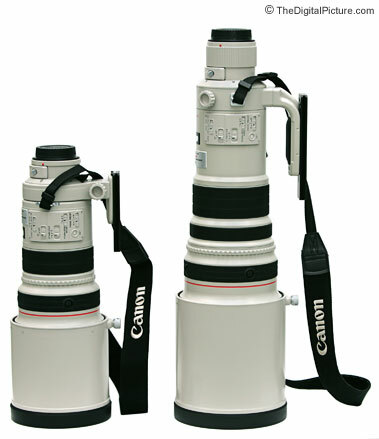 Note: The Canon EF 500mm f/4L IS USM Lens has been replaced by the Canon EF 500mm f/4L IS II USM Lens. Note that this lens has been replaced by the superior Canon EF 500mm f/4L IS II USM Lens. 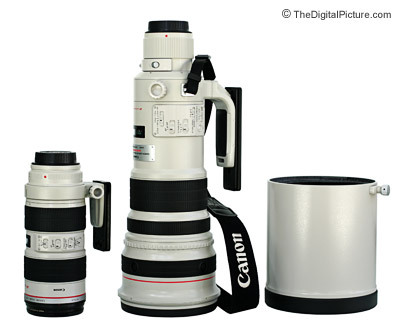 The Canon EF 500mm f/4L IS USM Lens is considered a Super Telephoto Lens. And super it is! A super long focal length is the biggest attraction to the 500mm f/4L IS and where the product category gets its title. Super image quality and sharpness are highly notable features. Super size might be a downside (unavoidable in a lens with the 500 f/4L IS's specifications). A super high price is not welcomed by most. And super-focusing. Utilizing Ring USM (Ultrasonic Motor), the Canon EF 500mm f/4L IS USM Lens focuses very fast, very accurately - and very quietly. FTM (Full Time manual) focusing is enabled. A 3-position focus limiter switch allows focusing distances to be limited to a specific distance range (4.5m to 10m, 10m to infinity, 4.5m to infinity) - or to be unlimited. Limiting the focus distance range can improve focus lock times and reduce focus hunting. Autofocus Stop buttons (near the objective lens) allow autofocus to be temporarily stopped. This feature is handy when tracking action in AI Servo mode and one-shot-style focus is needed for a specific situation - perhaps a focus-and-recompose portrait of a motionless person, bird, landscape or other subject. The 500 f/4L IS is equipped with a Focus Preset feature. Set the Focus Preset to a specific distance - when your shooting needs require that specific distance, simply turn the white knurled playback ring on the end of the lens. Autofocus Stop buttons near the objective lens allow autofocus to be temporarily stopped. 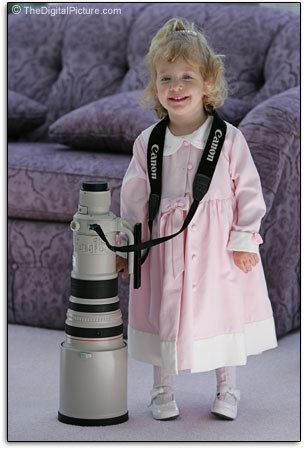 As you can see in the picture above, there is a minimum height requirement for using this lens. Mikayla has a few years to go. She thinks she is big stuff though! I was laughing when I took the picture, but I have gotten many more laughs from the online discussions that have occurred over this picture. Just to set the record straight ... 1. I did not use the 500 to tie the girl down. 2. I did not make her carry it for me. 3. My wife is just outside of the picture to the left - there was NO CHANCE my 500 was going to hit the floor. Thanks for the laughs! Image quality from the Canon EF 500mm f/4L IS USM Lens is just as super as you would expect. This lens is impressively sharp wide open and maintains excellent sharpness right into full frame corners. CA (Chromatic Aberration) is negligible, color and contrast are very good. A slight amount of pincushion distortion is present. Full frame body users will notice a slight amount of vignetting in the corners. Background blur quality is excellent thanks in part to an 8-blade aperture. This long focal length and relatively wide aperture of this lens makes it easy to create a very diffusely blurred background. Canon's 2008 Super Telephoto lens lineup is shown above. Beautiful, aren't they? The shortest lens standing on its rear cap in the center is the Canon EF 200mm f/2.0L IS USM Lens. To its left is the Canon EF 300mm f/2.8L IS USM Lens. Continuing left, the Canon EF 400mm f/2.8L IS USM Lens is shown resting on its tripod ring. Moving the top-most lens - this is the Canon EF 800mm f/5.6L IS USM Lens. Below it is the Canon EF 600mm f/4L IS USM Lens and the bottom-most lens is the Canon EF 500mm f/4L IS USM Lens. Build quality is in line with other lenses in the Canon L Series - professional grade. Of course, with a lens of this size, quality build brings along weight. Canon has made an effort to keep the Canon EF 500mm f/4L IS USM Lens as light as possible without sacrificing strength by utilizing a Magnesium alloy lens barrel. The included carbon fiber lens hood is very light (and very expensive to replace). You will want to use it for protection and improved contrast. IS (Image Stabilizer or Image Stabilization) allows the 500 f/4L IS to be handheld a full 2 stops lower than a 500mm non-IS lens. Keep in mind - IS does not help stop a moving subject, but it does amazing things for a moving camera/lens. With a super telephoto lens, image stabilization is even important with tripod use as wind and other destabilizing sources can add movement/vibration to your setup. Fortunately, the IS version on this lens is tripod-sensing. The 500 L IS knows that a tripod is being used when vibrations go below a certain level. Keep IS turned on when mounting the 500 L on a tripod to take advantage of this secondary IS mode - reducing mirror slap, shutter and tripod vibrations. When purchased from a reputable dealer, the Canon EF 500mm f/4L IS USM Lens comes packed in a 24" x 11" x 11" (610mm x 279mm x 279mm) lens trunk. A leather-like lens cover (it is more than a lens cap and a bit of a pain) protects the large objective end of the lens. The 500 L accepts 52mm rear drop-in gel filters in the provided holder. A glass filter comes installed - it is good for stopping dust before it enters deep inside the lens (a Canon 52mm Drop In Circular Polarizer Filter is available). On the protection subject - the protective objective lens element can be replaced relatively inexpensively should something unfortunate happen. My primary use for the 500 L IS is wildlife and bird photography where I need portability. Especially when going after the little critters, you cannot have too much focal length. Paired with the Canon Extender EF 1.4x II, the 500 L yields a 700mm f/5.6 IS lens with very reasonable image quality (some added barrel distortion, added CA and slightly reduced sharpness). The 500 L is also compatible with the Canon Extender EF 2x II. The resulting 1000mm f/8 IS lens shows noticeable image quality degradation - and only autofocuses on a 1-Series body (center AF point only). I also use the 500 L for large field sports where it also performs superbly. Prior to purchasing the 500mm L IS, my bird and wildlife lens was my Canon EF 300mm f/4.0L IS USM Lens along with a Canon Extender EF 1.4x II. This worked well, but did not give me enough reach. I simply missed a lot of good opportunities - I was too far away or I scared off the subjects by trying to get into range. Using the Canon Extender EF 2x II was not an option for me personally because the image quality of the combination was not where I required it to be, and at a minimum aperture of f/8.0 my then-current Canon 10D would not auto-focus. The next logical/significant step was the Canon 500 f/4L IS. This lens had the best combination of features for what I wanted. Reach, weight, IS, price - a bit too high, but ... and image quality: The 500's image quality is only very slightly below that of the Canon EF 300 f/2.8L IS Lens - which is about as good as it gets. Who said the Canon EF 70-200 f/2.8 IS L Lens (above left) was big? The 500 f/4L IS hood (above right) could swallow it up! The 500 is pictured with a Wimberley P40 Lens Plate attached to the tripod collar. The Canon EF 300 f/2.8 IS L Lens trunk (above top) is noticeably smaller than the Canon EF 500 f/4 IS L Lens trunk (above bottom). There are some serious considerations when mounting the Canon EF 500mm f/4L IS USM Lens to a tripod. First, the tripod and head must be able to handle the weight of this super telephoto lens. A good ball head such as the Arca Swiss Z1 Ball Head can handle the weight, but there is a strong risk of the heavy lens flopping over while you are making adjustments. A gimbal-type head is the answer to this problem. The Wimberley Tripod Head II is my prefered option and the Wimberley Sidekick attached to a good ball head is another good option. This makes a much more useable combination. I suggest a Wimberley P40 Lens Plate or a Wimberley replacement foot for the tripod ring. For transport in situations where the trunk does not make sense, various options exist. 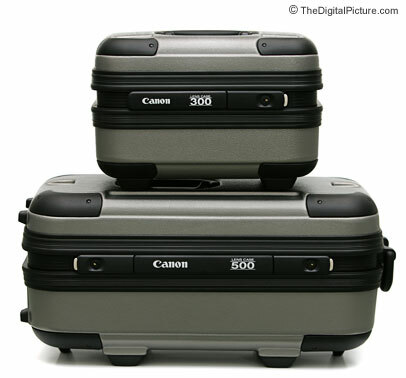 For airline travel, the 500 L will fit in the carryon-sized padded-divider version of the Pelican 1510 Hard Case. For use in the field, consider the Lowepro Pro Trekker II AW Backpack or Lowepro Photo Trekker II AW Backpack. Another excellent Canon L Series Lens, the Canon EF 500mm f/4L IS USM Lens is built to take the rigors of professional outdoor use. While the 500 L is most typically used for wildlife and sports, it will compress a distant landscape beautifully. The Canon EF 500mm f/4L IS USM Lens is simply a super lens.